written by Sr. Joseph Miriam M.S.B.T. 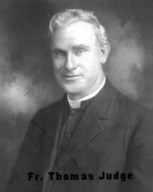 After the grace of God, the Missionary Cenacle Family owes its origin to the zeal and compassionate heart of a young priest, Thomas Augustine Judge, C.M., born in Boston, Massachusetts, on August 23, 1868, and ordained in the Congregation of the Mission (Vincentians) on May 27, 1899. Father Judge, after deep, persevering prayer, looked for signs from the Holy Spirit as to how he could respond to the needs of the Church in his time. The year is 1909;the Church is welcoming and trying to absorb immigrants, largely from the Catholic countries of eastern and southern Europe. Many of these were not instructed in their faith, and suffered in varying ways for being Catholic in a Protestant nation. Most were poor, very poor. Father Judge witnessed their hardships. He also witnessed the conflict in those Catholics who wanted to become “Americanized,” and so acted negatively toward the Church. He saw many good-willed families become indifferent to their Catholic heritage because they simply couldn’t cope with the pressures they faced each day. All would need guidance, instruction, help both materially and spiritually, and lots of tender concern from those Catholics who cared about them. Father Judge became convinced that the priest by himself could not meet the pastoral needs of the day. At the same time, he realized that there were devout Catholic lay people who could be a power for good in many difficult pastoral circumstances. He believed that this power had to be tapped, harnessed, and directed toward the spiritual and temporal welfare of others. So, at a meeting in Brooklyn, New York in April of 1909, Father Judge appealed to a small group of six women. He met with them in St. John Gabriel Perboyre Chapel associated with the Vincentian academic apostolate of St. John’s University, then on Lewis Avenue, and now with its main campus in Queens, New York. A short time later, in the course of preaching as a member of the Vincentian mission band, Father Judge met other men and women whose living faith and spiritual strength encouraged him to invite them to become part of the simple apostolic band he was recruiting for service to the Church and its people.Notice, it was a priest working with lay people. Father Judge did not start out with his own idea of founding a religious order, either of priests or sisters, and then having lay people attached to them as “helpers.” No, the laity came first and Father Judge became their example of missionary zeal and personal prayer. He taught them devotion to the Trinity—and that this devotion must find expression in love and concern for the neighbor—especially for those who have the greatest need—or who are the least appealing. Father Judge said this was not “some new spirit invented in modern times.” He held that “…it is the Gospel spirit,” explaining that it was the fire Jesus came to cast upon earth—that Jesus desired it to burn continually—that this is the work of the Holy Spirit he sent to continue his mission on earth. Father Judge realized that it was not only a matter of the Spirit’s giftedness in us, but also the response. Our response is the human side of God’s gift. The gift of the Holy Spirit blossomed from within willing persons into a new spiritual family. It had begun with Father Judge’s response to the promptings of the Spirit in the experiences of his priestly life. It deepened after his prayerful reflection on the needs of the Church, his generous exhaust of self, and in being alert to the Spirit’s gift in others. Early on, a few of the lay members gave themselves full time to the work of the Church, both in Baltimore, Maryland and in Bridgeport, Connecticut. This was quite informal and lasted only a short time. Unexpectedly, in l915, Father Judge was assigned to a remote mission in Opelika, Alabama. What could have been appeared as a terrible blow to the Cenacle brought astonishing fruit. Some of the men and women of the North followed Father Judge South. In the providence of God, these men and women became the beginnings of two religious communities: one of priests and Brothers; the Missionary Servants of the Most Holy Trinity (ST); the other of Sisters, the Missionary Servants of the Most Blessed Trinity (MSBT). In the course of the next seventeen years, the Missionary Cenacle developed into a full religious family, approved by the Church: lay apostles, religious priests, Brothers and Sisters and a Pious Union of women. From that time, what he came to call the Missionary Cenacle Family grew steadily. 1) Margaret Louise Keasey a school teacher from Butler, Pennsylvania who went south in 1916 to help with the Cenacle mission school in Phenix City, Alabama. Her obvious spirituality, leadership, and dedication caused Father Judge to name her as the first General Custodian of the MSBT Community under the name: Mother Mary Boniface. Many years later, in a General Cenacle, the MSBT’s recognized Mother Mary Boniface as their Co-Founder with Father Judge. 2) Dr. Margaret Healy a high school teacher in Queens, New York who had known Father Judge from his early preaching in Brooklyn, New York. Margaret had followed him as a lay apostle and became an effective recruiter of others. She came to be a beacon of lay Cenacle spirituality, formation and ministry. Father appointed Margaret Healy the General Custodian of the Missionary Cenacle Apostolate (originally the Outer Missionary Cenacle). She held this position until the 1960’s when, with the cooperation of Father Stephen Quinn, ST, Dr. Healy became the initiator of the Blessed Trinity Missionary Institute, whose members took private vows and remained as missionaries within their secular and home obligations. While Father Judge always remained a member of the Congregation of the Mission (Vincentians), in the 1920s the Vincentian Superior relieved him of his mission obligations in order that he might devote full time to the development of the Missionary Cenacle Family. Father Thomas Augustine Judge, CM died on November 23, 1933. His devotion to the Most Holy and Blessed Trinity lives on within the Missionary Cenacle Family and is the source of its apostolic zeal and desire to serve the needs of the Church today, especially among the needy and marginalized– and to continue to nurture a missionary spirit in the laity. "The History of the MCA Pin"